"what the war really is"
What if one day your favourite teacher had to leave your class and go to war? When you think about the people who fought in the army, you probably don’t think of teachers, but Vincent John Baird Hall enlisted two weeks after war broke out. Vincent had been an exceptional student during his time at Napier Boys’ High School. He was Dux in 1907 and a Prefect from 1907 -1908, and when he started working as a teacher at New Plymouth Boys’ High School, he quickly became the students’ favourite teacher and coach of the shooting team. In 1914, the school magazine The Taranakian said Vincent was such a great teacher they hoped that his bad eyesight would mean that he wouldn’t be accepted into the army. He taught classes until the day he left for Trentham, and the students all went to the train station to see him off. He took part in the landing at Gallipoli in April, 1915, but in the following month was severely wounded in the thigh and died a few weeks later in hospital. Soldier’s reports said even after being wounded he cracked jokes and tried not to make a fuss - he even insisted that there were wounded soldiers that should be taken care of first. You have been given a photo of Vincent and his colleagues at the Sphinx, which he sent home to his students at New Plymouth Boy's High School. You are now tasked with discovering more of the story behind Vincent Hall. How much of his story can you piece together? The suggestions below will help you on your research journey. The How We Find It Fact Sheet will also be a helpful tool in helping you discover the pieces of Vincent's puzzle. You're in luck, Vincent served in the New Zealand Army and so his records will be able to be found online at the Auckland War Memorial Museum Cenotaph. This is your most important search. Collect as much information as you can. Once you've found Vincent's Serial Number move to Archway and search for his service documents there. Obituaries in Papers Past often give us a lot of clues about a person - including their life and schooling. Use Papers Past and the phrase 'Vincent J B Hall' to search for Vincent's Obituary. This obituary tells us about his parents, his schooling, his sporting successes and his teaching career. Use each clue from the obituary to do further research online - (e.g can you find evidence of Vincent at Napier schools). how did vincent's students feel about him? Vincent's entire life saw him have a strong connection with schooling. He was much loved by his students and there are reports in the Taranakian of boys being very upset when he left New Plymouth quickly in order to enlist. It is reported that the boys ran after the train trying to catch a last glimpse of him. Vincent certainly made an impression. 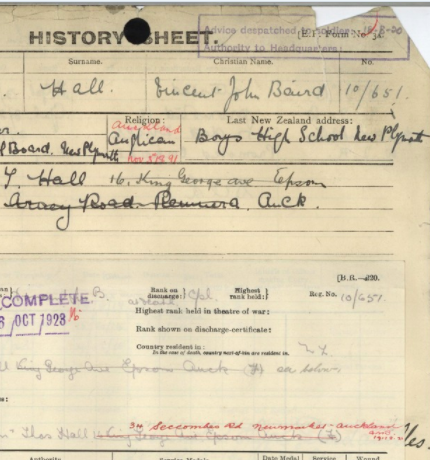 Use Papers Past to search for 'Vincent J B Hall' and discover what the Headmaster at NPBHS said about him. find information on Vincent's death in the new plymouth boys' high school magazine. The school magazine for New Plymouth Boys' High School is known as The Taranakian. This article 'Better than Ever' found in Papers Past talks about the fact that the most recent edition of the Taranakian contains crucial material from Harper Lepper about how "Mr Hall met his fatal wounds". The Taranakians are digitised and the specific volume can be found here . Can you find Harper Leppers letter back to the school about Vincent? Vincent's obituary reveals that he had a brother, Lionel. Use Google to discover the article written about Vincent and Lionel by Remuera Heritage. Use Cenotaph to find out how Lionel died and CWGC to find out where he is buried. What is the story behind the name of the cemetery where he lies? WHAT WAS IT LIKE TO VISIT THE PYRAMIDS? V J B Hall visited the pyramids while training in Egypt. The New Zealand troops came to be dubbed ‘Massey’s Tourists’ because of all the sightseeing and revelry in which they indulged. Use DigitalNZ to find images of other New Zealand Soldiers visiting the pyramids. "In memory of Lieutenant Harper M Lepper, Military Cross, who was killed in action in Mesopotamia," says the plaque. "Erected by his schoolfellows in the hope that his example may not be forgotten." Who was Harper Mervyn Lepper of Lepperton? Where is Lepperton? After his death, Harper's father received a Kodak Camera with undeveloped film. This is reported in 1916 Vol. 1 p11 of the Taranakian. What else can you find out about the Lepper family? Was the film ever developed? Vincent at the Sphinx is connected with the story of Vincent John Baird Hall who attended Napier Public School, New Plymouth Boys' High School, Napier Boys' High School and Auckland Grammar School.The original photograph is held by Puke Ariki PHO2013-0138. This story is told with the permission of Margaret Bullen, on behalf of the Hall Family. Vincent John Baird Hall left from Trentham in 1914. The Walking with an Anzac Team found the first clue in Vincent's story when they visited New Plymouth Boy's High School. Vincent was a much loved teacher who the boys were devastated to see leave. Further research on the same platforms you have used today allowed us to discover Vincent's Story. Research starting points for Vincent's Story. Vincent's Memorial in the Taranakian.